Nothing brings visitors and views to mainstream media websites quite like homicides in the windy city. When homicides are up, mainstream visitor traffic is good. But don’t expect to hear from the mainstream media anytime soon. This is because homicides are down from last year at this time. Yes! It’s true. According to data compiled by the Chicago Tribune, there were 260 homicides through the month of May in 2016. That was up significantly from 2015. In contrast, there have been 235 homicides so far this year. For those keeping count, that’s a reduction of 9.6 percent from last year. Hopefully, Memorial Day weekend will stay relatively quiet this year and homicides will remain at 235. Of course, the warm summer months are always the busiest time for crime in general, including homicides. Historically this has been the trend, and this is exactly what the data sets are saying. 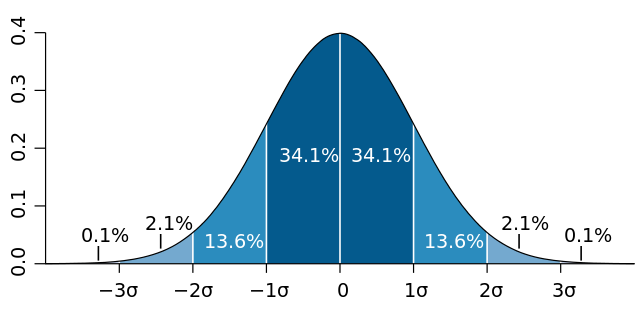 If the trends hold, then homicides in Chicago should follow a normal distribution, i.e., a bell-curve, although the 2016 distribution of homicides skewed left. This means that roughly about 68 percent of the homicides should happen within the warm months of the summer, or one standard deviation from the mean as the normal distribution above illustrates. Moreover, about 32 percent of the homicides should occur outside of the one standard deviation, or outside the warmer months. Does this mean the warm months of Chicago in 2017 will see more homicides than the warm months of Chicago in 2016? It does not. So far, homicides are down from 2016 and if this trend continues throughout the summer months, then homicides should remain down. But the reader should keep in mind that homicides are very difficult to predict. The only reason it is being suggested that homicides may trend below last year is because homicides are down. If they were up, then the prediction would be the opposite. Of course, this method is an archaic form of bayesian statistics, so take it with a grain of salt. What do you think? Do you think homicides will remain lower than last year? Or do you think homicides will explode over the summer months? Either way, please provide your reasons and explanations below.